IWLA nonprofit partner, American Logistics Aid Network is asking for your help and assistance to accommodate these recent unforeseen disasters. If you are located near disaster areas and can assist, please contact Kathy Fulton, Kathy@ALANaid.org or call 863.668.4238. Also, visit www. http://alanaid.org/ for the latest information. Flint, Michigan Water Crisis – ALAN has been in contact with the state and VOAD organizations in the past several weeks since this crisis was first revealed. The organization received its first requests for support this week. Vince Livingston, an ALAN volunteer based in Kentucky, has been coordinating the response. The State of Michigan requested pallet jacks for use at points of distribution. MHEDA member Quantum Lift donated and delivered the equipment within 48 hours of the request. The State of Michigan may need assistance setting up the warehouse when space is identified. This would include both expertise and equipment. FEMA has requested information on the supply chain for home water filter manufacturers. Richard Sharpe is assisting with this research. Several requests have been made for warehouse space (list follows). Multiple businesses and individuals have made connections to try to source this space, including Leslie Ajlouny and Derek Byrd of Evans Distribution, Tim Feemster, Peg Wilkens of Stevens Van Lines, Mike Mullane of Sphere WMS, Doug Bailey of HighJump WMS, and Bob Scherman of Flint Distributing Company. Additional suggestions for contacts for these are greatly appreciated. European Refugee Crisis – Our partner Airlink is working with nonprofit International Medical Corps on moving a shipment of baby carriers, solar lanterns, infant hygiene kits, and diapers to be distributed to refugee families arriving in Greece on the islands of Leros, Kos, and Samos. Airlink has asked our assistance in finding donated/discounted transportation for 19 pallets that need to move from Kansas City, Kan., to Chicago, Ill., O’Hare airport. TIA has shared this through their network and many businesses have replied requesting additional information about this move. Texas Tornadoes – Tim Feemster is working with the Society of St. Vincent de Paul to locate a facility for their “House in a Box” distribution. Missouri Floods – Adventist Community Services is opening a multi-agency warehouse. 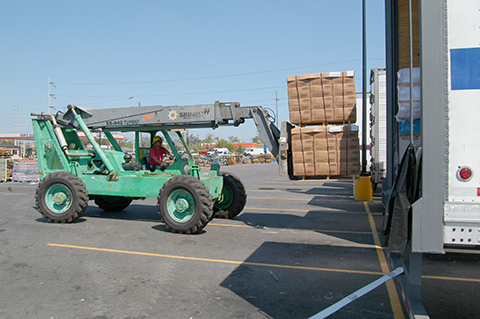 Penske Logistics donated the use of a box truck and CHEP donated several hundred pallets. The following items are still needed. Transportation of seven pallets of cleaning supplies from Keene, Texas to Centralia, Missouri. South Carolina – Society of St. Vincent de Paul is looking for a location for their “House in a Box” distribution in Charleston, S.C. They need 10,000 – 15,000 square feet of unmanaged space. A former retail location with a single loading dock is ideal, as the public will pick up from this facility. ← What is New at the 2016 Convention?